Ferdinand David (German: [ˈdaːvɪt]; 19 June 1810 – 18 July 1873) was a German virtuoso violinist and composer. Born in the same house in Hamburg where Felix Mendelssohn had been born the previous year, David was raised Jewish but later converted to Christianity. David was a pupil of Louis Spohr and Moritz Hauptmann from 1823 to 1824 and in 1826 became a violinist at Königstädtischen Theater in Berlin. In 1829 he was the first violinist of Baron Carl Gotthard von Liphardt's (father of Karl Eduard von Liphart) string quartet in Dorpat and he undertook concert tours in Riga, Saint Petersburg and Moscow. In 1835 he became concertmaster (Konzertmeister) at the Gewandhaus in Leipzig working with Mendelssohn. David returned to Dorpat to marry Liphart's daughter Sophie. 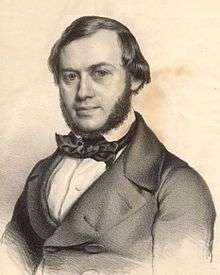 In 1843 David became the first professor of violin (Violinlehrer) at the newly founded Leipziger Konservatorium für Musik. David worked closely with Mendelssohn, providing technical advice during the preparation of the latter's Violin Concerto in E minor. He was also the soloist in the premiere of the work in 1845. He died suddenly in 1873, aged 63, while on a mountain excursion with his children, near Klosters in the Graubünden (Grisons) area of Switzerland. David's own compositions number about 50 opuses. They include 12 "theme and variations" pieces for violin and Orchestra, five violin concertos, a string sextet, "Concertino's" for each; Violin, Bassoon, Clarinet & Trombone and Orchestra, and a number of Lieder. Supposedly he also wrote two symphonies and an opera (Hans Wacht, 1852). Unfortunately; these have not been found again. David's most played piece today is without a doubt his Concertino for Trombone and Orchestra (Op.4). This piece is very often used as the obligatory piece when auditioning for symphony-orchestras around the world. David had close connections with Breitkopf & Härtel and other publishers in Leipzig, and also worked as editor of violin works including those of Francesco Maria Veracini, Pietro Locatelli and Johann Gottlieb Goldberg. He was editor of the complete Beethoven piano trios for C.F. Peters Edition. He was also editor of the set of J.S. Bach's Sonatas and Partitas for solo violin in 1843. He made an arrangement for violin and piano of Niccolò Paganini's 24 Caprices for Solo Violin, which was the version used for the world premiere integral recording of the Caprices, by Ossy Renardy and Walter Robert in 1940, the centenary of Paganini's death; this was seven years before Ruggiero Ricci made the first recording of the original solo violin version. The Chaconne in G minor attributed to Tomaso Antonio Vitali was published for the first time from a manuscript in the Sächsische Landesbibliothek in Dresden in David's well renowned violin-method Die Hohe Schule des Violinspiels (1867). He also wrote an often used version of the cadenza for Beethoven's violin-concerto, used by 12-year old Joseph Joachim at the revival-concert of this piece in 1844, under Felix Mendelssohn-Bartholdy. David played on a 1742 Guarneri violin, which later became the main performance violin for Jascha Heifetz. The David Guarneri violin is now in the collection of the Fine Arts Museums of San Francisco; it is on permanent loan to Alexander Barantschik who has showcased it with the San Francisco Symphony and San Francisco Academy Orchestra. On the recommendation of William Sterndale Bennett with whom he had worked in Leipzig, his son Paul David became the first Director of Music at Uppingham School from 1864–1908. ↑ "David, Ferdinand (1810-1873) - Composer". Hyperion Records. Retrieved 2013-09-03. 1 2 Silvela, Zdenko (2001). A new history of violin playing : the vibrato and Lambert Massart's revolutionary discovery. USA: Universal Publishers. p. 140. ISBN 1581126670. ↑ Woolf, Jonathan (2003). "Ossy Renardy. The Great Violinists Volume XVIII". Musicweb-international.com. Retrieved 2013-09-03. ↑ Matthews, Bryan (1984). By God's Grace. A history of Uppingham School. Wikimedia Commons has media related to Ferdinand David. "Ferdinand David". Messianic Judaism Wiki. 2011-11-14. Retrieved 2014-01-01. Jong, Cameo (2012). Rediscovering Ferdinand David's violin pedagogy through his Violinschule and zur Violinschule (Thesis). University of Iowa. Retrieved 2014-01-01.